Well, Saddam Hussein is dead. I’m sure the countless families of the people he tortured and murdered are rejoicing. The world is well rid of him, that’s for sure. But does that mean I think we had any business invading Iraq in the first place or that his execution is going to lead to anything positive in this insane war? Not hardly. Instead of thinking about Saddam Hussein’s depraved legacy, I’d rather point you to a voice that should be heard far and wide—the articulate comments of a woman who is very much against the war but whose Marine son is currently serving in one of the most dangerous parts of Iraq. I can’t even imagine how I’d be coping if my only child were part of this nightmare. I try to put myself in Donna’s shoes when I think about what she’s going through on a daily basis, but I’m quite aware that any anxieties I have about my daughter pale in comparison to what this Marine mother must be feeling, especially when she is so ideologically opposed to our government’s actions. I first hooked up with my old high school friend Donna Anton about a year ago when we started talking about planning our 30th reunion. Donna had found me through this blog, and I enjoyed reconnecting. She was now living in Cornwall, England, and I surmised that her decision to leave the States was due in no small part to George Bush’s re-election. I had always enjoyed Donna's cynical sense of humor, even more so as an adult. I was interested in her take on the situation in Iraq and intrigued to learn about the very different leanings of her 20-year-old son who felt it was his duty to serve his country in this conflict. Last month Donna began her excellent blog called Mother Courage in which she shares her growing impatience with the Bush administration as well as her heartrending feelings about her beloved son’s decision to participate in this debacle. Donna has had several letters published in The New York Times and elsewhere, but I am grateful that she now has a regular forum for her views. 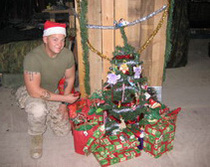 The fact that my son is in Iraq has turned the world as I knew it upside down. On good days I’m a complete basket case; on bad days I clearly understand why people turn to drugs and alcohol to numb the terror, to take the edge off the stress, to dull the ache. Unfortunately, save for the magic of triptans for migraines, I am almost irrationally drug-averse. Living with fear of loss is a terrible thing, one step before loss itself. My fear is mixed with rage, as my letters make clear. I am furious at the Bush administration for sacrificing almost 3,000 young lives over an ideology mixed with back-room politics that led to a bungled invasion and an ill-planned war. Before Christmas, Donna bemoaned George Bush’s decision to wait until after the holidays to decide what should be done in Iraq. Needless to say, after being unable to avoid the continuing grim news out of Iraq—three U.S. soldiers killed on Saturday, three more this morning—I’m comforted to know that my son is OK—for now—but as anxious as ever over his continued safety as well as the “additional sacrifices,” as George W. Bush calls the inevitable future casualties, yet to come. This is quite aside from the despair and anguish I feel for the soldiers’ families who received the ultimate tragic news this Christmas weekend. “In a span of a few hours, 2,973 people were killed in the Sept. 11, 2001, terrorist attacks. In a span of 45 months, the number of American troops killed in Iraq exceeded that grim toll as the war continues. Jonathan Lootens, from upstate New York, joined the Army. “This is something I have to do,” he told family members. The 25-year-old sergeant was killed during his second tour of duty when a roadside bomb went off near his vehicle in the city of Kirkuk. Marine Lance Cpl. John Edward Hale was only 15 and living in Louisiana when the planes hit the World Trade Center, but he never forgot what happened. He joined the Marines after graduating high school last year, and was only in Iraq for three months when he was killed by a roadside bomb. Michael Glover joined the Marines after his boyhood neighborhood—the Belle Harbor section of Queens, N.Y.— lost several residents in the Sept. 11 attacks. Glover was killed by a sniper while on patrol in Fallujah. Any of these could be my son. What’s more, I know I’m deluding myself into thinking that if he can just get through this tour of duty—if he can survive the next three months—all will be put right: my sanity will return, I’ll sleep again through the night, my family will remember that I can converse about topics besides Iraq, and I can take a break from blogging. But the tragic upshot is that kids are being killed on their second or third tour, after they’ve already risked their lives for Bush’s war of choice. And if Bush, who is deluded, gets his way, if Congress capitulates to his bunker-mentality demands, and Iraq is flooded with a “surge” of “fresh” U.S. troops, it means kids on their fourth or fifth tour, decades before they deserve to, will have one more crack at meeting Charon. 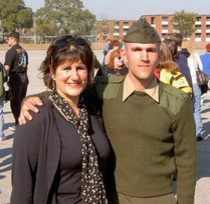 Read more of Donna’s thoughts on her blog and try to imagine how you’d feel if your child were stationed in Iraq on this last day of 2006. Thanks, Danny, for this wonderful post about Donna and the grim reality that she faces daily. I will make sure to check out her blog. And a very happy New Year, BONNE ANNÉE, to you and to all of those who are dear to you. May 2007 bring you all its very best. Wonderful post Danny..Donna is quite extrordinary...Thanks for the post and the "heads-up" about her blog, too! A VERY VARY HAPPY NEW YEAR, MY DEAR, To You and Kendall and Leah...! May 2007 be The Best Year Ever, for you and yours! I was so moved by this post, I couldn't even bring myself to comment upon first reading. How generous of you to share Donna's writings, Danny. Donna, I can only imagine what you live with each day. You are brave, as is your son. I work with a woman who is going through the same thing. I'll send her the link and see if it helps her. Thanks so much for posting this. Thanks for this relevant reminder, Danny. And a very happy new year to you and yours, with all that you wish for coming true/through. Thanks, Danny. If I ever become famous (for something other than speaking out against Bush and the war) and need a PR man, I'll know who to call. Looking forward to more of your amusing and touching posts in 2007. Michelle Almond Moore also has a son over there. He is with the 1st Infantry Division and this is his second tour. For his insight on Iraq, you can check out his myspace page at www.myspace.com/lunchboxxx420.